I’m asked about this a lot: how to get a job in another state or another city. It’s not easy- You need to avoid discrimination based on your location, handle complicated interview and travel schedules, and more. There’s a reason so many people become frustrated soon after they start applying for jobs out of state. 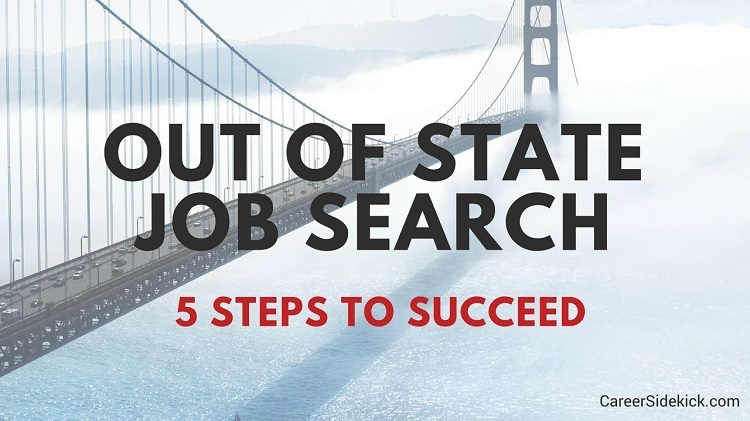 Fortunately I’ve helped a lot of people do this successfully as a recruiter so I’m going to walk through five tips that will help you get out-of-state job offers much faster. This is REALLY important when looking for an out of state job. Don’t cut and paste generic info into every cover letter. You need to catch their attention and explain why you’re relocating to THEIR city. Let’s talk about the first point first. You need to sound 100% sure you’re moving. No company wants to hear that you’re tentatively thinking of moving but only if you find the perfect job. They probably won’t interview you if you say that because you’re a RISK! A risk that you’ll waste a companies time, money, and even accept a job and then bail at the last minute because you’re anxious about moving. So to succeed in landing a job in a new state, you need to sound as low-risk as possible when you apply for the job, and your cover letter is the first place you can do that. You do that by showing them you’ve thought seriously about moving and are fully committed. This is rule #1. Be low risk! I wrote an in-depth article in this that became one of the most popular posts on the blog. It’s about how to handle the address/contact info section of your resume when applying for jobs out of state. Should you put your current address and risk losing out on interviews from companies who want local candidates only? Or should you lie and put a local address? That can be risky too. If they think you’re local, they aren’t going to offer to pay for ANY travel for the interviews (because they don’t even know you’re traveling). Also they’ll usually mail your job offer to the address you gave them on your resume. So if it’s a fake address, you’re in trouble. If it’s a family member’s address, you’ll be okay. But there’s a third option for your resume when you apply for out-of-state jobs, and I think it’s the best by far. Here’s what to do: Where you’d normally put your address, just put “Relocating to ___ (city) in (month/year)”. Example: “Relocating to Memphis in January 2018”. This isn’t a lie, and will help you seem low-risk like we talked about above (it shows that you’re serious about moving, and implies that you are moving with or without a job). When you get on the phone with an out-of-state company, you need to sound laser-focused. You need a great reason for wanting to move to their city, and ideally you want to be able to say it’s the only city you’re looking at. Just like when you sent in the job application, your goal here is to put their mind at ease and show them you’re 100% serious about working for them. You also want to have a very specific idea of the type of job you want (and you need to show them that their job fits with what you’re looking for). So make sure you research the job and company beforehand. You can’t sound like you’re applying to every job in their city or they will NOT hire you. And if you do this right, it’ll work in your favor. It’s very powerful to be able to tell a company “Listen, I’m only looking for jobs in Dallas and I’m only looking at Senior Engineer positions”. That’s the type of focus you need to show. That will help reduce the perceived risk and calm the interviewer, but not completely. After you do this, you still need to tell them why you’re looking for jobs in their specific city. Whether you’re able to tell them their city is the only one you’re looking at, or whether you’re looking at two or three cities, you need a great reason for why their city is a possibility! If you followed the advice above you showed them their city is one of the few you’re looking at, and their job fits with what you want to do next in your career. But now you need to tell them why you’re looking at moving to their city. The best reasons are family and friends, or that you’ve visited the city multiple times and like it. If you have a spouse or boyfriend/girlfriend and you’ve made the decision with them, mention it. It makes it sound more convincing and “secure” (ie- you aren’t doing it on a whim and you aren’t going to change your mind). The biggest red flags for me as a recruiter are when someone has never visited a city they plan on moving to before, or they don’t know anyone in the city. If I hear you know people there or have been there before, I’m instantly a lot less skeptical. “I want to move there to be closer to family” (I love this line because you don’t necessarily need family IN the city for it to be true. You just need some family members who are closer than where you currently live). If you’ve followed the steps so far… you have applied for some out of state jobs, landed some phone interviews, and hopefully got invited to the next round. There are a couple of things you can do to make this part easier on yourself. First, if they know you’re out-of-state, ask how much of the process can be done via phone and video interview. The goal isn’t to sound like you’re trying to avoid ever going in face-to-face. Bad idea (the rare company will allow it, but don’t ask). The goal is just to get as much of the process done BEFORE having to visit face-to-face. That way you and the company both have a good idea of whether it’s a good potential fit before any travel happens. When it does come time to visit an out-of-state company by driving or flying, ask if they cover travel expenses. Don’t be shy, it’s a normal question to ask and it could save you hundreds of dollars. If this is a higher level position, there’s a greater chance they’ll pay. Don’t expect to have your expenses covered if you are looking for an entry-level job with no work experience. That way you don’t have to travel back and forth as many times to interview with multiple companies. It’s always worth following-up with the companies you’ve had phone interviews with if you’re going to be in the city. Even if you haven’t heard feedback yet. Maybe they liked you, haven’t had a chance to send feedback, but would like to meet you face-to-face. Now you know how to get a job in another state, but it still takes work and effort. If you follow these steps above you are going to have the greatest possible chance of finding an out-of-state position, but remember to be patient and persistent. Since you searched and found this article, I’m guessing you have a big reason (or multiple reasons) for wanting to relocate. It might be money and opportunities, or a more personal reason like family. Whatever it is, remember why you started this out-of-state job search and don’t give up if things get tough, or if it takes longer than expected to get interviews, or if you go interview with one or two employers but don’t get a job offer. Keep going. Your next interview could be the one, and you’ll be glad you didn’t doubt yourself or give up too early. As a final note, if you don’t want to leave anything up to chance in your interviews, I’ve created a new step-by-step interview answer guide to show you EXACTLY what to do and say in your next interview to get a job offer. You can learn more here.